Sensitization about Disability is the most vital advocacy activity as only through generating awareness will people get to know the various aspects they could extend their support for. On the similar lines, Sensitization Workshop was conducted at JLL, India by our Project Manager, Sanjukta Mohanty last week in Gurgaon. Employees participated in the whole activity based workshop and tried to understand the challenges a person with disabilities generally faces at the workplace. Lets’ Make a World of Equal Opportunity! Mandar Jukar is a slow learner and this is not the only challenge he faces in his life. He says, “My father died when I was very young and thus meeting the basic needs of my family also came out to be a great concern. And, as I take time to learn things, no one was ready to give me a job. I always aspired for a support who could pull me out of these challenges, and then one fine morning, I got a call from Sarthak Educational Trust. The person said, I just need to register and furnish my marksheet and certificates to avail a free 3 months training and placement support. I doubted but gave it a chance. Sarthak invites you to be part of more such journeys of making someone’s Dreams come True. We are working for Persons with Disability since 2008 and provide them various support services, such as Early Intervention, Inclusive Education, Skill Building, Sustainable Employment, and Advocacy. Dr. Aggarwal was recently felicitated at the Award Ceremony organized bySambodhi Research & Management Institute at The Lalit New Delhi. 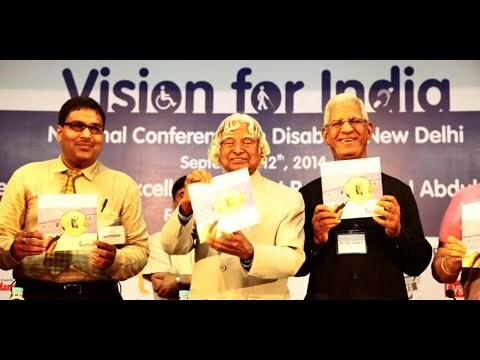 Dr. Jitender Aggarwal along with our National Advisory Board Members Shri Sandeep Bhargava Ji & Dr. Virender Singh ji. 28th Round Table Conference organized at Sarthak Educational Trust, Ludhiana. A unique initiate of Sarthak, a platform facilitating the corporate houses to present their views on the hiring front of people with disabilities and discuss a way forward for their large scale inclusion in the workplace. In the presence of the management of 12 corporate houses, discussion & deliberation took place on September 8, 2017, to work on the future course of action. In the glimpses, heads from Bansal Knitwears, MS Infotech, Mentor India, Akal Spring Limited, C Net Computers, A Hotel, Vodafone Network & BPO, Nikhar Parlor, Punjab Printing Press, and others. Your share could be as good as a donation for Sarthak Educational Trust!